Posted 26 December 2014 under Ask Us. The easiest way to keep track of your periods is to write down when they start and when they stop. Some girls like to keep a small calendar in their purse so they can mark the days of the month when they have their period (Ex. with an X). This can help you anticipate when you will likely get your period the following month. Remember the first day you begin to bleed is the “first” day of your menstrual cycle. On average, bleeding will usually last 3-5 days but can range from 2-7 days. To figure out the “length” of your cycle, begin counting on the first day of bleeding (which is also called “cycle day 1), until the first day of your next period. The average menstrual cycle is about 28 days, but it can vary quite a bit. The range for adult women is every 21-35 days and for young women, the menstrual cycle can range from every 21-45 days. Keeping track of your periods is a good way to see if there’s a pattern to your menstrual cycle. 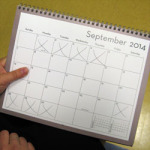 Bring your calendar with you when you see your health care provider.